What does Spinoza mean by truth? When we think about truth normally in philosophy then we think about the agreement between a statement and a state of affairs in the world, but this can’t be what Spinoza means by truth, at least not in any simply way. Why is this? Because for Spinoza truth cannot be the agreement between two different attributes, since attributes can have no causal relation to one another. Thus the idea of ‘tree’ cannot be true because it agrees with an object called a ‘tree’, rather an idea is true because it is true in itself and not because it ‘represents’ something else. What then does it mean to say that an idea is true in itself? In one sense, Spinoza is repeating the story of truth that we have heard since Plato: perception is not sufficient to explain truth. This is because, as we know, perception does not tell me truth about things at all. Indeed if all I had were perceptions, then I probably wouldn’t have a very good idea of reality at all. One of the basis premises of the new modern science is what common sense tells us about nature (which we might say is the Aristotelian starting point) can only lead us astray. Common sense might tell me that the earth is at the centre of the universe, because that is how it appears to me, but I know in fact that this is not the case. What is true is not what my senses tell me, but what true knowledge does, and true knowledge is not perception, as Plato would have already told us, but mathematics. Copernicus does not disagree with Ptolemy because he saw something different in the heavens, but he postulated a different mathematical model and that is why he saw the heavens in a different way. It might be the case that Galileo did see something different in his telescope, but he wouldn’t have seen what he was looking for unless he had already agreed with Copernicus’s mathematical revolution. If an idea is not true because it agrees with what I see with my eyes, then why is it true? Here we have to make a difference between the psychological event of having an idea and the content of the idea itself. I might be thinking of a circle because I see a circle. Or I might be thinking of circle because I associate it with something else. Perhaps I have being thinking about bears and then the idea ‘circle’ just pops in my mind. Or, I might be thinking about circle, but I have completely the wrong idea of circle in my mind. I might think lines drawn from the centre of the circle are not equal. None of the instances of thinking of the idea circle would make the idea true. The occasion of thinking the idea does not make the idea true (and this is really the reason why perception cannot be the source of the truth of ideas, since it psychologises them, and would make truth subjective). What is true is the objective content of the idea itself, which can be thought by anyone (or anything if it capable of thinking true ideas). In proposition 35 of the second part of the Ethics, Spinoza explains how such an error is possible. There is no positive idea of falsehood. Strictly speaking there are no false ideas in themselves, because every idea is an idea of something that exists. Rather there are confused ideas. To have an ignorant idea is to have an idea of a positive thing, but in a confused way. The example that Spinoza gives in the scholium is the idea of freedom. Why is it that people falsely believe they are free? The answer is because they are ignorant of the causes that make them act the way they do. Because they are ignorant, they therefore think they are free. The cause of false ideas is not a real idea, but ignorance on our behalf, and this ignorance is always ignorance about causes. To use the other example that Spinoza gives in this scholium. I believe that the sun is 200 hundred feet away from me because I am ignorant of the true distance. Even though I know that the sun is further away than it seems. Because the distance that it appears from me is caused by the relation of my body to the sun, I might still fall under the error that the sun is closer than the actual distance. Of course I can also understand why it is that the sun appears in the way it does to me (I can understand for example that the sun really doesn’t get larger at sunset or change from yellow to red, but this is the effect of light in the Earth’s atmosphere), but that means I have to have a true idea of what the sun is and what the my body is and how they interact. Because of our limited knowledge, Spinoza thinks that is very easy for us to have inadequate of idea of things, but does he think that we can have adequate idea? It would surprise us if he said ‘no’ to this questions, since Spinoza is an exponent of the new modern science. He is a realist. He does not think that our scientific theories are just our way of understanding what reality is, but are true picture of what is. Indeed Newton’s laws would be true, even if there were no human being to think them. The difference is between understanding a particular thing as a mode or as an expression of substance. Let say I look at a stretch of water that is in front of me. I could just describe the water as I see it, perhaps in the way that I writer might describe it in a story, or painter paint it. Or I could describe it in terms of substance. Not just this stretch of water in front of me, but through an attribute that expresses not just this part of reality, but the whole of reality. Isn’t this just what science does? Science does not explain this or that particular instance or occasion of water, but the reality of water as such, which for Spinoza would be explained in the current scientific explanation of nature through the general laws of physics. This would be to have an adequate, as opposed to an inadequate understanding of water, because I would be understanding its true cause, which is substance explained in this case through the attribute extension. The laws of physics are what Spinoza calls ‘common notions’. The occasion for us to have ideas is our bodies, for this nothing in our minds that does not come via our bodies. Thus if we didn’t have eyes to see the sun, then we wouldn’t have the idea of sun. The error, then is not think that the ‘truth’ of the idea of the sun somehow has its origin in us. We can think the true idea of the sun, because the true idea of the sun corresponds (or is the same as) as the causal relation between the mode and substance. There cannot be any other idea of the sun that is true because nature cannot be any different than what it is, otherwise substance would be lacking that different reality and therefore would not be infinite. How can we escape the confused ideas of the realm of sensations and affections? We can only do so when we understand ideas internally and not externally. To understand ideas internally means to know the necessary order and connections of ideas themselves and not how they are encountered through affections. Yet even though I might know the difference between the two, how do I take the step from one to the other? It is probably wrong to say that Spinoza rejects imagination, because this would be argue that he rejects the body, but as we know, for Spinoza, only through the body can I know the world. There must then be a route from inadequate to adequate knowledge, and the key is ‘common notions’. Inadequate knowledge only tells me about my individual encounters with things. What Spinoza calls duration. How something appears to me at a certain time and place, and which I might subsequently remember and associate with other things. But I can, through duration, leap out of duration. I can recognise what is ‘common to all things’. In so doing, I am understanding the mode through substance and not through another modes, which I can only have a limited knowledge of. It is possible to understand the causal relation between substance and modes. It is not possible to understand the infinite causal relation between modes (it is this inadequate understanding we have seen, for example, that produces the error of free will). It is very important not to confuse common notions with universals. 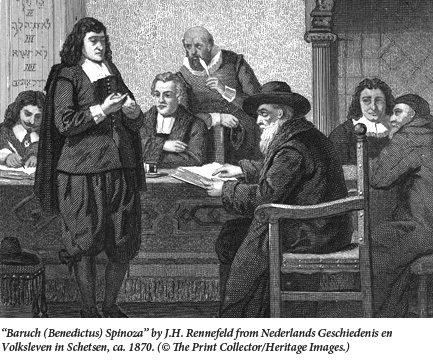 In IIP40S1, Spinoza disputes the existence of universals precisely because they are not common notions. I can have an adequate idea of scientific laws of nature that are common to all bodies, but what I cannot have is the idea of all horses that would be common to the universal ‘Horse’. The latter is merely a word, whereas the former is a true idea. This is why we differ in what we mean by the word ‘horse’, but we do not differ when we understand what is common to all things (like extension and the laws of nature that follow immediately from it), because this is common to nature as such, and not just a use of words. When we understand the universe, we understand it as it is in reality, and our understanding cannot be any different from God’s (what the universe is in reality in terms of truth), because there couldn’t be any other understanding. There is no mysterious transcendent cause, nor any distinctive human understanding (as there is in Kant for example) that would be any different from truth of what is actually in reality, which would be true whether we knew it or not. It is possible to have adequate ideas because it is possible to know the causes of things. Of course as finite beings, it is not possible to for us to know the cause of everything, but that does not mean that we know nothing. It is possible for us to understand the essence of God for example, for Spinoza. It is possible for us to understand the idea of a triangle, though it is not possible for us to have the idea of every triangle that has ever existed. To have an adequate idea is to understand something through its cause rather than its effects. Thus to have an adequate idea of the sun is to understanding why it makes my skin feels warm and appears closer than it is in reality, as opposed to an inadequate idea, which starts with effects, my warm skin, the appearance of the sun and the sky, and argues backwards towards the cause. The sun is close to me in the sky because it is circling the earth; the sun warms the my skin because it was created by God to benefit human beings. Both these arguments are false because they argue from effects rather than causes. To understand the effects of the sun through its cause is to follow the order of reality itself. It is to go from substance as it expressed through its attributes and then to modes. Rather than to start with modes and to try and get back to attributes and from there to substance. We have only distinguished between inadequate and adequate knowledge in this lecture, but there is third level of knowledge that Spinoza describes in IIP40S2, which he calls ‘intuitive’. We will have to wait to Part 5 of the Ethics to find out what this. So far, in relation to part 2 of the Ethics, we have only spoken about the mind and not the body (and the mind in relation to the attribute of thought). The particular nature of human beings, however, is that they are the union of a mind and a body. What, then, is the relation between the mind and the body? First of, unlike Descartes, Spinoza begins with the body not the mind. If we are going to understand the nature of the human mind, we first of all have to understand the nature of the human body. This quite is different from Descartes who believes that the union of the body and the mind must be thought from the vantage point of the mind and not the body, and the mind is the truth of the body and not the other way around. In proportion as a body is more capable than others of doing many things at once, or being acted upon on in many ways at once, so its mind is more capable than others of perceiving many things at once. This explains why the next section of Part 2 has to do with the general nature of bodies. If we are to understand the human mind through the human body, then we have to understand the nature of the human body first. The human body, of course, is acted upon as any other body is in nature. To put it within a modern context, to understand human psychology we first of all have to understand physics and biology. 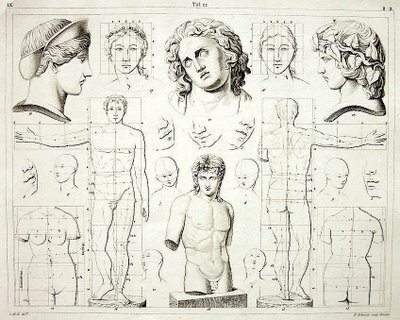 For Spinoza’s interests in the Ethics is human happiness, then the central idea in this excursus, as Curley indicates, is the idea of the composite body, which is a body that can be acted upon by many external bodies without losing its identity (Curley 1988, p.76). There are many different bodies in nature: basic chemical elements, simple material objects, simple organisms, and more and more complex forms of life. For Spinoza, the human being is a very complex living organism that is made up of many individual bodies, and is affected by many other bodies, in very many complex ways. What we can or are able to know for Spinoza, is directly related to the complexity of our body to be affected: everything that we know, from the simplest and most basic, to the most complex and extraordinary, first has to come to through the experience of our bodies. The relation of the mind to the body also explains the limitations of the human knowledge, and the possibility of inadequate ideas. If we have inadequate ideas, then it is because we have a confused or distorted understanding of the body. Thus a false idea, or an inadequate idea, is not false at the level of the mode of thought or mode of extension, but in the relation between them. To understand this relation we have to understand how the human mind comes to inadequate ideas of things. The human mind does not perceive any external body as actually existing, except through the idea of the affections of its own body. For if the mind, while it imagined nonexistent things as present to it, at the same time knew that those things did not exist, it would, of course, attribute this power of imagining to a virtue of its nature, not to a vice. Inadequate ideas are those ideas which are caused from outside of my mind. This is only a partial knowledge of an object, whereas adequate ideas, within the internal necessity of the order and connection of ideas, are a complete or whole conception of the object. If we only remained within the external relations of the mind to objects, then we would only have a partial and mutilated understanding of the universe. But why is this understanding only partial and mutilated? This is because the body has a negative impact on the causality of ideas, if we assume that we only know things through perception. Thus, I am affected by the rays of the sun as it warms my face. There is nothing in common between me and the sun, and therefore, at this level, I cannot have an adequate idea of the sun. Rather, as we have already said, this relation tells me more about the body affected (in this case myself) than the body which is the cause of the affection. As Deleuze says in his lectures on Spinoza, a fly would be affected by the sun in a different way (Deleuze 1978). The reason why this is inadequate knowledge is that I only know the sun in terms of its effects on my body (just as the fly only knows the sun in terms of the effects on its body) and not in terms of causes; that is to say, what the cause of the sun and what is the cause of the heat on my face and so on. To know that I would have to know what my body was and what the sun was, and I could not know that simply through the effects of one body on another (it is not through the warmth of the sun against my face that I know that my idea of the sun is adequate and the idea of the sun of the fly is not). Inadequate ideas are therefore representation of effects without the knowledge of causes. The idea of inadequate ideas will become very important in the rest of Spinoza’s Ethics. For to live at the level of the knowledge of effects, that is to know nothing of the causes of things, is to live a life of encounters only. One sensation follows another sensation, but I have no real understanding of the causes of these sensations. This is the level, unfortunately, that most of us live. When we come to think about our ethical life, this means that we are completely under the control of one feeling following another, like a paper boat buffeted by the mighty waves of the ocean of emotion. If we knew the true cause of these emotions, then we would be in control of them, rather than they in control of us. Knowledge of these true causes is the aim of the rest of the parts of the Ethics. Lahn, B.T., 2004. Human Brain Evolution Was a “Special Event.” Available at: http://www.hhmi.org/news/lahn3.html [Accessed November 25, 2012]. Humans have extraordinarily large and complex brains, even when compared with macaques and other non-human primates. The human brain is several times larger than that of the macaque — even after correcting for body size — and “it is far more complicated in terms of structure (Lahn 2004). We can of course improve our bodies in relation to instruments, but these instruments themselves have to relate to what our bodies can interact with. There is no point having a powerful electronic magnetic microscope if we can’t make available to the human eye the images that it produces. Having just finished the first part of the Ethics, with all its complexity and difficulty, we now advance into the second part, which is just as difficult and complex. Ostensibly the object of the second part is ourselves, whereas the object of the first part was God. And yet reading the definition and axioms, and the first 13 propositions, we might feel that we haven’t left the topic of God at all. But then we have to understand Spinoza’s perspective. He wants to rid us of any idea that we are somehow apart from the rest of the universe and have a special place within creation, what might be called the anthropomorphic bias of philosophy and religion. We must remember that it is this anthropomorphism which is the true cause of the idea of a personal God separate from the universe He creates (It is this transcendence Spinoza wants to destroy). Rather than seeing ourselves as somehow unique (only God is unique for Spinoza), we must see ourselves as just one element within the universe, or what Spinoza would call modes (and a finite mode at that). Spinoza expresses this beautifully in the preface to part three when he writes that there are some who conceive of human beings as though they were a ‘dominion within a dominion’. Human beings are not substances, but modes for Spinoza; that is to say, they are not transcendent but immanent to the universe, part of its processes and necessary laws. This is not to say that Spinoza is not interested in human beings. Far from it, this is the only thing he is interested in. For Spinoza, like all great philosophers perhaps, philosophy is not just a clever game and how much one knows, but how one should live one’s life. This is why his book is called the Ethics. He writes, therefore, about metaphysics and physics, not just for their own sake, but for the sake of how we might, as part of this infinite universe, lead a better life. As we saw earlier in this course, this idea of ‘leading a better life’ is not the same as being moral, which we, after thousands of years of Christianity might confuse it with, but begins with our human nature as part of nature as a whole. Morality and the personal God are intimately linked, because both abstract human beings from nature. This is true of Kant, for example, who writes after Spinoza, and who, although he is willing to place human being as natural being with nature, wants us, as moral beings, to be set apart: the moral order of human intentions, has nothing at all to do with the deterministic physical laws of nature. There is another difficulty facing us in the second part of the Ethics, however. That is on the whole hitherto we have been speaking about the infinite attribute extension. This is because this is the easiest way for us to enter Spinoza’s philosophy, perhaps because most of us have an understanding of modern science, and the Aristotelian universe is something we are unfamiliar with, whereas for his contemporaries it would be the other way round. Modern science already contains the idea that all individual things are in fact modes of the fundamental structure of the material universe which is governed by universal and necessary laws. But extension is only one the attributes of substance, and in fact there must be, as Spinoza writes in IP11, an infinity of attributes since God is an infinite substance consisting of infinite attributes. When it comes to human beings, we can only speak of two attributes: thought and extension. But how do we think of thought as an infinite attribute of substance? It is easy to imagine each singular objects as the mode of extension (even ourselves when we consider ourselves as physical objects), but it is much harder to think of thought that way, because we think of thought as precisely that which individualises us. Remember this is precisely what Descartes did think. Each individual was a separate individual substance, because they were independent; that is to say, I cannot think the thoughts you are thinking now, and you cannot think the thoughts I am thinking. But it is precisely this way of thinking that Spinoza avoids when he says that there is only one substance, and thought is an attribute, not a separate substance, and moreover every individual thought is a mode of this attribute. This means that it is not I who think thought, but thought that thinks through me, and when I perceive something it is not I who perceive it, but God who perceives it through me. We have to think of thought in exactly the same way that we think about extension, as an infinite autonomous and spontaneous attribute containing infinite modes. It is the universe which thinks for Spinoza and that is why we think, and not the other way around. God or substance is thought under the attribute thought, such as God or matter is extension under the attribute extension. Thus we have to stop ourselves thinking of thought as something that happens in individual minds, which are modes. Rather it is the other way around. Thoughts are modes which are caused by the attribute thought, which is the same as saying, that they are caused or produced by God as a thinking substance, God under the attribute thought. 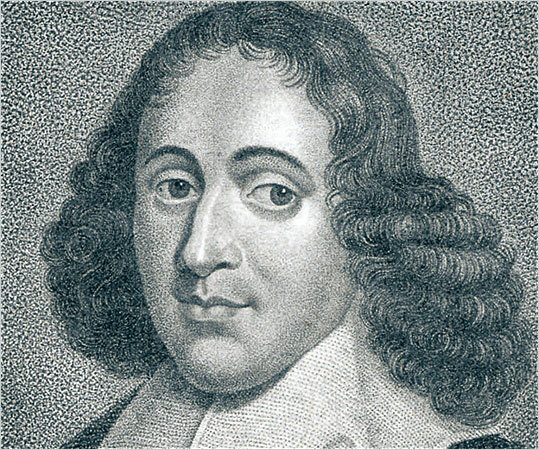 This is why for Spinoza it is perfectly possible to say that machines could or can think, since thought is not a unique property of human beings, but is an attribute of God or the universe. In fact for Spinoza everything in the universe thinks (or is at least is ‘animate’), and all we can say is that human beings, in terms of thought, simply think in a more complex way than stones, plants or animals. Ideas exist independent of the human mind, and are produced by God under the attribute of thought, in the same way that things are produced under the attribute of extension, so that there is the sun as a thing, and the idea of the sun which are two different modes of two different attributes, extension and thought which are immanent to the same infinite uncreated substance. The idea of there being real and immutable essences of geometrical figures, essences, which have an existence independent of any instantiation they might have in the corporeal world, and independent of any idea there might be of them in human minds. (Woolhouse, 1993). This is why, as we said earlier, it is perfectly possible for a machine to think the idea of triangle, for the truth of triangle is not produced by the human mind, but by the universe, which contains an infinity of ideas as it contains an infinity of things. What we have to do then is think the idea of the sun in the same way we think the idea of triangle. As we shall see later, this does not always happen with human beings, because we tend to think the idea of things in terms of the affections of our body, through what Spinoza calls imagination, and not through our minds which can grasp the idea of things in themselves as they are produced by the infinite attribute of thought as it expresses the infinite nature of the universe. So we imagine the idea of the sun is produced in our minds by the external object which has an effect on our body, but this only produces a false and mutilated knowledge for Spinoza. Again this is very difficult for us to accept because we tend to think a true idea is the adequation of the idea with an object. Thus, if I have the idea of the sun, this idea is true because the idea agrees with the real sun outside in the real world. Now this cannot be possible for Spinoza because attributes are autonomous. This idea of truth as the agreement of the idea and the external object would rest on the mysterious possibility that things could miraculous transform themselves into ideas, that the sun could become the idea of the sun and the object and the idea were one and the same thing, but we cannot think one attribute through another, as Spinoza writes in 1P10. But it is clear that Spinoza believes that we have true ideas of objects, so how is that possible. His assertion is that there is a parallelism between the order and connection of ideas on the one hand, and the order of the connection of things on the other, that although these two series are absolute autonomous, and they have to be since one is produced through the attribute thought and the other through the attribute extension, that none the less they are absolutely identical, and they are so in themselves and not in the mind that thinks them. This doctrine of parallelism is one of the most difficult notions to explain in Spinoza, but before we can do so, we first of all need to think about what Spinoza thinks an idea is. As we have already seen for Spinoza, ideas are not produced by human minds, though human minds can think them. Rather, they are produced by the attribute thought which is independent of any other attribute (independent in the sense of self-sufficient not independent in the sense of substance). So we can imagine the universe not only filled with an infinity of modes of extension (trees, plants, animals and human beings to be rather parochial about it), but also filled with an infinity of ideas (the idea of trees, plants, animals and human beings and so on). How do we know that one series agrees with the other, that the idea of the tree is the same as the tree? The answer cannot because we say so, because this is to make the human mind a ‘dominion within a dominion’ and thought dependent on us, rather than us dependent on thought. Ideas are produced by God, or Nature or the Universe or Substance, whatever word you choose. Ideas are very strange things, and are different from other modes, in that an idea has two different functions (ontologically they exist as one in the idea, we separate them out in terms of analysis), which Spinoza has a special vocabulary to express, though it was a vocabulary that all his contemporaries also used, and which Descartes, for example makes much use of in his Meditations. Ideas are peculiar because they have both a formal and objective reality. Now one of the best explanations of this distinction can be found in Deleuze’s lectures on Spinoza which can be found on the web (Deleuze). An idea is a thought in the sense that it represents an object, so the idea of the sun represents the object ‘sun’. What an idea represents is called the objective reality of an idea. Now this is probably what we all imagine an idea to be and we do not think of anything else, but for Spinoza an idea has another reality which he calls the formal reality of the idea. Now just as much as the objective reality of an idea is something that makes sense to us, then the formal reality of an idea does not. What can an idea be but the representation of an object? Well the idea is just actually what it is as an idea, or as Deleuze puts it, ‘it is the reality of the idea as much as it itself is a thing’. Thus we must separate in our minds what is represented in the idea, which is the object of the idea, and the idea itself which represents the object. So in fact there are not two things: the idea and the object, but three: the idea, the object as it represented in the idea, and the object. Or, the idea sun, the sun as it is represented in the idea of sun, and the sun as an object. Now to the extent that the idea itself is a thing (not of course a thing in the sense of the object, since it falls under the attribute thought, and not under the attribute extension, but still nonetheless a thing for Spinoza, or if one prefers a mode), then I can have an idea of this idea not as an objective reality but as a formal one. I can think the idea of sun as the idea, and not I in terms of what it represents. It is through this difference between an idea and the idea of an idea that we can begin to understand the parallelism between the order of ideas and the order of things. We begin here because we start with what we are as human beings. We know ourselves and the world through our bodies, but what is peculiar to us (what makes us more complex than stones plants and animals) is that we are capable of reflection; that is, capable of having an idea of an idea. I do not just think of objects but also I can think of ideas; ideas can become an object of another idea. I have an idea of the sun, which represents the sun to me, but I can also just think about this idea in itself. Now it is the idea of an idea that for human beings (not for God) that we can begin to see how truth is possible (or as Spinoza would say we can think adequate ideas), and notice that truth here is between an idea and another idea as the object of this idea; that is to say it is immanent to thought, and does require the agreement between thought and the external world of objects. The idea is the result of the active power of the mind as a mode of the infinite attribute thought. It is not a copy of an object. Therefore an idea cannot be true by pointing to something in the object, for whatever I would be pointing to would itself be an idea, or better the relation between ideas. When I say that truth is the conformity of the object with the idea, then this conformity itself must be an idea, or in Spinoza’s language, an idea of an idea, and this ‘conformity’ cannot itself be an object. The idea itself must be adequate, and it can only be adequate because I can think it as so. The idea is true to the extent that it conforms to the object of the idea, but it does so only because it contains all the causes and reason of that object, which themselves are internal to reason (not human reason, but Reason itself). To have a true idea therefore is know the cause of ideas. The cause of ideas is the necessary relations between them. These necessary relations are not produced by the human mind, but by the power of thought itself. What we have to understand is that if ideas where only the representation of objects, then there would be no necessary relation between ideas, and if there were no necessary relations between ideas, then there would no possibility of science. What we have to say is, ‘What are the necessary relations between ideas?’ which is the same as saying, ‘what is the causal relation between one idea and another one?’. We have to make this distinction between the idea as a representation and the idea as a cause, and again for Spinoza we cannot say that this necessity of ideas lies in the object, because all attributes are autonomous. We cannot think a thought under the attribute extension, just as much as we cannot think an extended thing under the attribute thought. Reflection does not produce truth; it only discovers it. It is the discovery through human knowledge of the order of ideas as caused by the attribute Thought. But how do we get from these necessary causal relations of thought to the necessary causal relations of things, and at the same time understand that they must be identical, without one being the source of the other? The answer to this question is to concentrate on the idea of causality. Both ideas and things are produced simultaneously through their attributes. This means that things, which are the object of ideas, follow the necessity of their attribute, with the same spontaneity and autonomy, as the ideas of these things follows the attribute of thought. If thoughts are connected together by necessary order of connection, then things must also be connected together necessarily, and this necessity must be the same. They are the same not because things determine thoughts, nor thoughts things, but this necessity comes from the infinite nature of the one substance, which these two attributes express. Thus to use Spinoza’s example in IIP7S, the circle and the idea of the circle are other to one another, since they fall under different attributes, though the necessary connection between things and the necessary connection between ideas is identical. It is not that the necessary causality of things determines the causality of thought, but the necessity of substance (this necessity must be the same otherwise there would be as many substances as there would be attributes). In thought the connection between ideas is produced by the necessary causality proper to thought, and this order is the same as the order of things under the attribute extension. They are the same, because both are immanent to the same substance which is infinite and unfolds in a necessary way through each attribute. This does not mean, however, that attributes are fused together in substance. Each attribute is autonomous and so expresses the necessity of substance in its own way. As Gueroult, writes, they are both indissoluble and heterogeneous (Gueroult, 1974, p 90). 1. Ayers, M., & Garber, D. (Eds.). (2003). The Cambridge History of Seventeenth Century Philosophy (Vol. I). Cambridge: CUP. 3. Descartes. (1985). The Philosophical Writings of Descartes (Vol. I). (J. Cottingham, R. Stoothoff, & D. Murdock, Trans.) Cambridge: CUP. 4. Gueroult, M. (1974). Spinoza (Vol. II, L’âme). Paris: Aubier. 5. Kant. (2003). Critique of Pure Reason. (H. Caygill, Ed., & N. K. Smith, Trans.) Basingstoke, Hampshire: Palgrave Macmillan. 6. Woolhouse, R. S. (1993). The Concept of Substance in Seventeenth Century Metaphysics. London: Routledge. And in this sense, he is very different from Descartes who writes philosophy first of all because of science and not ethics, notwithstanding his book on the passions. (Descartes, 1985). He wants to make room for human freedom. See, for example the preface to the second edition of the Critique of Pure Reason (Kant, 2003). See, (Ayers & Garber, 2003). Spinoza did not use the word ‘parallelism’ to explain his philosophy. Rather, it was Leibniz. In other words, truth has nothing at all to do with sensation. You are currently browsing the Lectures blog archives for March, 2014.